> Help & Advice>Buying Guides>Guitar> Why Do Some Guitars Cost So Much More Than Others? It’s probably the single thing we’re asked most in the guitar department: why are some guitars so much more expensive than others? It’s a fair enough question given that you can buy a new guitar as cheaply as £50 or you can spend many thousands. Surely it must be hard to justify such a huge variation in cost for what is essentially the same design of instrument? There are three main factors that effect the relative cost of a guitar: the amount of hand work or skilled labour that is applied in the build process, the materials from which it is made, and the country it is made in. In this article we’re going to take a look at the three factors and why they are important in producing a good quality instrument. It takes somewhere in the region of 100-200 hours (depending on the design and ornamentation) for a skilled craftsman to make an acoustic or classical guitar from scratch. Sounds like a lot of work, right? That’s how many of the master guitar makers of the 19th and early 20th Century made their guitars and it’s still how some individual makers build today. But it’s insanely time consuming and, even at the paltry hourly rate guitar makers generally work for, it ends up with a very costly instrument. The proliferation of modern technology has played a big role in reducing the time involved in making a guitar. Many of the more laborious and less skilled jobs involved in guitar making can now be speeded up by machines and, particularly as CNC manufacturing finds its way in to the industry, some jobs can be done entirely by a machine. CNC manufacturing is undoubtedly transforming the budget industry in terms of producing consistent quality at very low prices, but it’s also hugely useful to small makers to take care of smaller, time consuming jobs. Since most guitars you will see in a music shop are made by companies that have at least a few employees, and many by large factories, the way the workers are trained and deployed makes a big difference to cost. Ideally, you want your guitar to be made by someone who understands everything that goes into making a great guitar and can tie up all the elements into a great sounding instrument. This is the best possible way to get a great guitar and, if you can afford it, it’s the route to go down. However, someone who has devoted many hours to learning a craft is going to be expensive to employ: if you’re running a business, it’s far better to employ people who are trained to do a specific job within the build process than it is someone who can make a guitar from start to finish because they’re going to be cheaper and easier to find. To take this to its logical conclusion, you can build a guitar from start to finish with a workforce of factory workers trained in a particular job. When you look at many of the popular professional guitar models – a Martin D-28, a Gibson J-45 or a Taylor 310 for example – that’s the process through which they’re built and, as each worker is highly skilled in their step of the build process, it still results in a very good guitar. If the company wants to get the cost down further, then it reduces the skill level required of its workers. For example, the top bracing is a crucial part of what makes a guitar sound great. The braces are glued onto the top oversize then carefully carved and sculpted to create exactly the right tensions and flexibility for the top: brace the guitar too heavily and it will sound dull and lifeless, too lightly and it will gradually pull itself apart under string tension. Unfortunately since wood is an organic material and every piece differs slightly from the next, it’s not possible to have a uniform shape and thickness at which the braces will produce the correct results, and a skilled guitar maker goes through the time consuming process of bracing each top based on the qualities of the individual timber. If the maker wants to save some of that time, the easiest answer is to use a pattern where every guitar is braced the same but to leave the braces deliberately thicker than they need be so that an unusually flexible piece of wood won’t result in a guitar that folds up under string tension. Suddenly you’re making guitars much more quickly and cheaply, but they don’t sound as good. To summarise then (assuming equal quality of materials) a company where the instruments are largely handmade under the supervision of one skilled person is likely to produce the best sounding guitar, a factory making instruments by a well trained workforce taking their time on each instrument and operating to high manufacturing tolerances is likely to be much more affordable and still of very high quality although not in the same league as the hand made guitar, and a factory making instruments with workers of a more basic level of skill taking less time on each instrument is going to produce an affordable but less good sounding guitar. The cost of the materials is a big contributing factor is how much the instrument costs. Different species of wood can differ dramatically in terms of value depending on how easy the species is to come by, where it comes from and whether it is protected for environmental reasons. Some woods, such as Rosewood from Brazil which was commonly used in expensive classicals and on many vintage Martin guitars, is protected to the extent that it is completely illegal to harvest and any Brazilian Rosewood used today requires paperwork to demonstrate that it was harvested prior to the ban and has been purchased legally – consequently it is very hard to obtain and expensive to buy. However, in acoustic and classical guitar construction there is a much more obvious factor that effects the cost of the wood used: whether it is made from solid wood or laminated wood. Laminated wood usually comprises a thin veneer of attractive looking wood on the outer faces with a core of much cheaper wood in the centre: it is therefore very cheap to buy compared to solid wood. Plywood is manufactured industrially, is strong and easy to store, which adds to the advantages: solid wood once planed to anywhere near the thickness of a guitar top or back is fragile and prone to warping, so needs careful storing and handling before use. However, laminated timber is also very stiff and does not produce a particularly good sounding guitar, so generally the only guitars that use laminated timber throughout are very cheap entry level instruments. Since the top is the most critical part of the guitar in terms of sound quality and much of the function of the back and sides is to reflect sound rather than to vibrate and produce sound as the top does, a popular compromise is to make the top of the guitar from solid wood and the back and sides from ply. This is commonly the construction found when you go a little way up the price ladder, and guitar with a solid top and ply back and sides can be a really great sounding instrument. On more expensive guitars the back and sides will generally be made from solid wood and this generally adds a little more depth and volume to the sound. Although wood is the main ingredient in an acoustic or electric guitar, there are also a number of mechanical parts that contribute to the functionality of the instrument and the quality of these parts also makes a difference. In particular good quality, precisely engineered tuners are much nicer to use than cheaply made tuners which can be imprecise and temperamental. Electronic components in amplified guitars are also an obvious example where better quality parts contribute a lot to a great sounding guitar. Wherever a company decides to make a guitar, there will be a number of fixed costs associated with the manufacture of the instrument and those costs will differ dramatically depending on the country of origin. Manufacture in Europe, the US and Japan is typically very expensive compared to countries such as China, Korea and Indonesia – consequently the majority of cheaper guitars are made in those countries. How much this impacts the quality of the instrument is a difficult question. It’s very difficult for Western countries to compete with Far Eastern ones at a lower price point, so most Western manufacturers have given up trying to compete at the lower end of the market. Conversely if a country is perceived as being known for cheap, low quality instruments, it’s hard for a manufacturer to compete at the other end of the market against product being made in countries that are perceived to produce high end instrument. Consequently the vast majority of high end instruments are made by companies based in the US, Europe and Japan and the vast majority of cheaper instruments are made in China and other parts of Asia – but a workforce with the right level of skilled labour should be able to produce a great guitar regardless of the country the instrument is made, so it’s not fair to assume a guitar made in China is automatically inferior to one made in the US. So how do these factors come into play when choosing a guitar? A good case study to use to demonstrate the effect of more hand work in a guitar might be the Burguet brand of classical guitars. Burguet is a small company based in Spain who make a range of classical guitars ranging from £1000-£6000. They offer an entry level model called the Model 3, a step up guitar called the Model 2, and then a series of more advanced guitars hand made largely by individual family members. The difference between the Model 3 and the Model 2 is that the Model 2 has bracing that has been ‘tuned’, i.e. they have been thicknessed by hand to get the best out of the materials, where as the bracing in the Model 3 is uniform. Forsyths sell dozens of these models a year so we’ve played a large number of them find the results of this are that the Model 2s are typically louder and more responsive, and that they are very consistent from one to the next. The Model 3s are still a nice sounding guitar but the majority are not quite as resonant, and they vary a little more from one to the next. So that element of hand work really does make a difference in terms of consistency and in squeezing a little better performance out of the materials. Burguet also offer their student guitars in a choice of solid top / laminated back and sides or all solid woods, so we get to see the effects of solid vs laminated timber very clearly as well. The main thing we notice with the all solid guitars is that they typically sound a little louder than the versions with laminated back and sides. This makes good sense from a physics point of view: in both guitars the sound waves emanating from the top reflect off the back and sides in a similar manner so both guitars share the tonal characteristics of the wood, but in the guitar with solid wood back and sides the back is able to vibrate more freely, generating new sound waves in addition to the ones emanating from the top. So how can you apply this to choosing a guitar? At the end of the day it comes down to the individual to decide how much it is worth spending. It's certainly not the case that a £2000 guitar is ten times better than a £200 guitar, but the £2000 guitar will almost certainly be better in tone and playability, and for many the improvement is worth spending the extra – whether that applies to you is your decision. What we will say is that, within a budget that is comfortable for you, you should buy the guitar that makes you happy and inspires you to pick it up and play it: a £200 guitar that sits in the corner barely being touched is not as good value as a £2000 guitar you play for hours every day – but if the £200 guitar inspires you to play, that's fine too! The decision is yours, but remember whatever your budget and requirements we're here to help, and we're always happy to spend time you going through what options will suit you best. 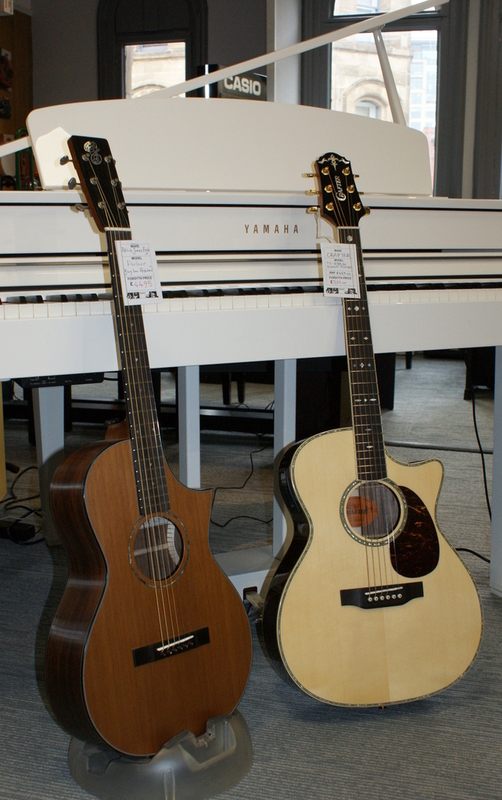 In the photo: two very pretty guitars - but the Patrick James Eggle is £4500 and the Crafter is less than £400. Why? The PJE is made in Shropshire by Patrick and a small team of experienced makers, and it has critically endangered and hard to find (and, we hasten to add, bought legally by Patrick!) Brazilian Rosewood back and sides. The Crafter is produced in a large factory in South Korea and has laminated Rosewood back and sides. They're both good value for money at their respective price point but the Eggle is definitely a Ferrari to the Crafter's Volkswagen.